Energy, adaptability, and resiliency – the building blocks of a great project and a great leader! It is with great enthusiasm that we announce that Clare Ashbee is our new Vice-President of Sustainable Building Solutions. Clare has been with EllisDon for just over a year, working with the Capital and International teams developing business strategies and relationships. Clare has already demonstrated her strong leadership skills and keen business insights, which will now be focused on building our skills and reputation as the best builder of high-efficiency, resilient and sustainable infrastructure. With a background in consulting, structured financing and banking gained from prestigious international firms including Investec Bank in Toronto and PricewaterhouseCoopers in London, England, Clare has a wealth of experience in originating and closing large scale energy, transportation, waste and social infrastructure projects. Her experience also includes international development having held positions at the Aga Khan Foundation and the African Development Bank. Having lived and worked in 4 continents and traveled to 52 countries, throughout her career Clare has gained a breadth of insight into different ways to approach problems and building cross-cultural relationships. 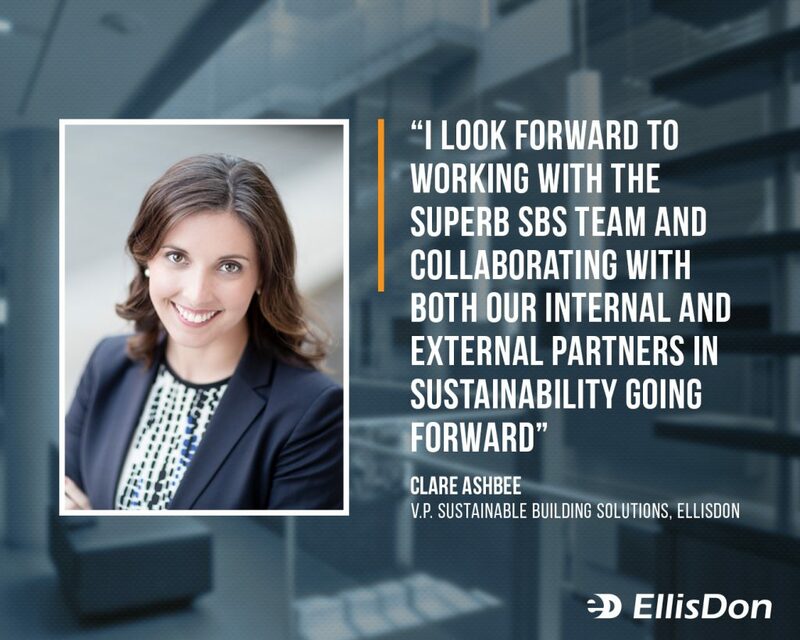 “I look forward to working with the superb SBS team and collaborating with both our internal and external partners in sustainability going forward,” said Clare. In 2015, Clare was nominated for the Canadian Women in Infrastructure Emerging Leader Award. Please join EllisDon in congratulating Clare and the entire SBS team on this exciting new chapter in our growth.